Isn’t it amazing how you have one idea of what a film was like, watching it years ago, only to find that when you watch it again, you are incredibly wrong. I remember seeing Audrey Rose in the 80’s on TV and at the time I thought it was a creepy tale of reincarnation. Having viewed it again, yes it’s still about reincarnation but creepy? Maybe not so much. Is it because I have seen so many horror films since that I have become desensitized? Or maybe it just wasn’t that creepy in the first place? The Templetons lead a pretty normal and happy life when one day, Janice Templeton notices a strange man hanging around the school of her daughter, Ivy. Obviously a little concerned as he starts following them home, the man, Elliot Hoover, introduces himself and tells them that he believes Ivy to be the reincarnation of his young daughter, Audrey Rose, who died in a car accident. Thinking the man is a freak, Bill Templeton demands that Elliot leaves them alone. Then Ivy starts having vivid nightmares that become uncontrollable and only Elliot is the one who can stop her. The basic premise is interesting. Doing for Hinduism what The Exoricst did for the Catholic Church. Reincarnation is something that not many people really understands and so a film like this could tip the balance. Except the way in which this is done lends more to melodrama than a full appreciation. It does try to explain the ideas but in such a way that if you blink, you’d miss it. Director Robert Wise is use to scaring us, as he was the helmer of one of the best creepy horrors around, The Haunting. Yet here, he allows too much of the film to be played out as a slice of melodrama, with his cast turning the hysteria up to 11. This isn’t a quiet film, with a large proportion given over to shouting and screaming. It’s also not that scary, and where The Exorcist (and I know I shouldn’t compare the two but they seem the closest in style and ideas) built up the tension and so the shocks were even more shocking, here it gives us the usual happy families lifestyle then the creepy guy hanging around the school and the next thing you know, the young girl is going crazy and doesn’t stop going crazy for the rest of the film. What also doesn’t help, and I know I shouldn’t say this about people’s looks, but Susan Swift just looks…odd. She has the presence of someone much older than her 8 years and so watching her, in a performance that wasn’t that great anyway, just became even more unbelievable. 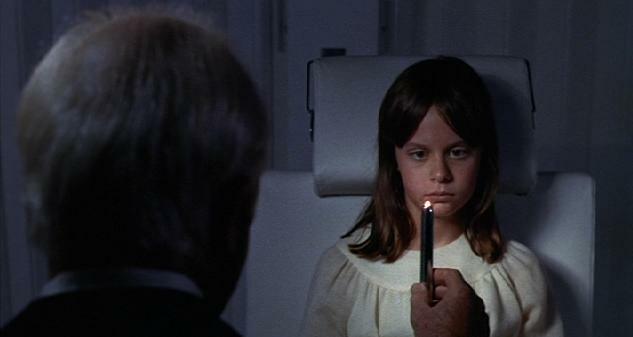 Her scenes in which she is supposed to be trapped in the burning car became more annoying than shocking and when you compare her to Linda Blair’s Regan in The Exorcist, it was like watching amateur hour. The rest of the cast valiantly battle with the ludicrous script. Marsha mason, more use to doing Neil Simon comedies, seems slightly out of her depth as Janice, resorting to hysterics at every opportunity, while Anthony Hopkins does come off better with a much more restrained performance. John Beck as husband Bill struggles to move away from basic anger as an emotion and so plays the whole film that way. Frank De Fellita’s book, which he claims is based on true events, is an interesting and quite intense affair. Unfortunately, translating that to the screen, the film propels itself to being more and more ludicrous and with a finale that doesn’t ring true whatsoever. Wise was a highly respected director who gave us classics like The Sound Of Music, West Side Story and the aforementioned The Haunting. Here he has given us a drab, somewhat dull shocker that doesn’t shock and doesn’t excite either.